New Delhi: A Three days International Yoga Fest was inaugurated by the Union Minister of Information and Broadcasting and Urban Development and Housing, Shri. M.Venkaiah Naidu at Talkatora Stadium, New Delhi today. The International Yoga Fest is being organized as a Curtain Raiser for International Day of Yoga (IDY) 2017. 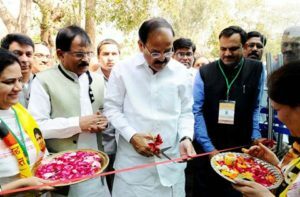 In his inaugural address, Shri Venkaiah Naidu said that Yoga is the only solution to bring harmony and unity among people. While addressing the participants in International Yoga Fest, he also said that Yoga plays an important role to stay healthy and fit. Shri Naidu further said that Prime Minister wants yoga to become a people’s movement and has spread yoga to 192 countries across the world. The Minister also thanked Yoga Gurus and Yoga Masters who are contributing to make Yoga a people’s movement. Speaking on the occasion, the Union Minister of State for AYUSH (Independent charge) Shri Shripad Yesso Naik said that Yoga has earned the global recognition for its holistic health potentials and therapeutic credentials. The AYUSH Minister explained that Yoga is a traditional system of Indian medicine, it has the vast potential of prevention and therapeutic dimensions. India, being a home of more than one billion population needs an effective and holistic AYUSH system in health sector, so that large work force can be utilized in a cohesive and productive manner. Shri Naik further said that with the advancement of modernization, busy and hectic schedule of the social life, the significance of Yoga has greatly increased. The Minister said that the scientific community, Yoga researchers, Educationists, and Therapists have started churning the very possible use and zest of Yoga in every field and walk of life. This enthusiasm will facilitate a new paradigm of Yoga for overall development of human beings. Shri Shripad Naik informed the participants that the Ministry has taken several initiatives to promote Yoga among the masses. A franchise based Yoga league for popularizing and making Yoga youth friendly is being conducted. 200 fellowships are being given to AYUSH research scholars. One National Award and one International Award for the outstanding individual or organization for the promotion and development of Yoga will be given from this year. On this occasion Secretary AYUSH, Shri Ajit M Sharan informed that State Yoga Fests are being conducted in different parts of the country in line with the International Yoga Fest organized last year. He said that activities relating to Yoga will be observed throughout the year. The secretary informed that the text books and course curriculum on Yoga have been prepared by the committee headed by Dr. H.R. Nagendra in consultation with UGC and CBSE. The three days event is being organised by Ministry of AYUSH, Morarji Desai National Institute of Yoga (MDNIY) in association with Indian Yoga Association (IYA) and New Delhi Municipal Corporation (NDMC) to sensitize the masses regarding celebration of International Day of Yoga held every year. Yog Rishi Swami Ramdev, Dr. H.R. Nagendra, Swami Chidananda Saraswati, Sh. O.P. Tiwari, Smt. Hamsa Jayadeva, Brhmkumari Asha, Swami Bharat Bhushan, Swami Ritawan Bharati, Sister BK Asha, Sh. S.Sridharan, Swami Darshak, Swami Ullasa were Guest of Honor on this occassion. More than 3500 participants including the eminent Yoga Gurus, Yoga Masters, Scholars, Policy Makers, Bureaucrats, Yoga enthusiasts and Experts of Allied Sciences and representatives from 15- 18 countries are participating in this mega event. During the International Yoga Fest Parallel Yoga Workshops from morning to evening by eminent Yoga Masters and Yoga Gurus will be conducted. Besides this Lecture/ Special Yoga Techniques / Yoga Demo by Yoga Masters, Satsang/ Isha Music/ Discourses/ Cultural Program by eminent Yoga Gurus, Yoga Demo by the students of leading Yoga Institutions / Yoga Professionals also being organised. A large number of following Institutes are participating in the Fest. Post Fest Yoga Workshops will also be conducted by Leading Yoga Gurus including Baba Ramdev and Yoga Masters of different Schools of Yoga on March 10th, 2017 at MDNIY, New Delhi. Besides the above main programmes, Special Yoga Techniques, Cultural programmes, Isha Music, Satsang, Exhibitions, Quiz, Elocutions, Poster Presentations, etc. also being conducted during the event. An exhibition of more than 50 stalls is also organize where books, DVDs, Yoga appliances and other Yoga related products displayed for promotion and sale.